A 45-year-old female presented with an abnormal screening mammogram, and subsequent diagnostic mammogram and ultrasound appearance were nonconclusive. MRI was recommended for further evaluation and showed a Type 3 enhancing kinetic curve highly sug- gestive of malignancy. Therefore, core biopsy was performed and revealed sclerosing adenosis. Diagnosis of sclerosing adenosis can be difficult with mammogram, ultrasound, and MRI, and tissue diagnosis may be required for definitive diagnosis. There have only been a few cases in the literature reporting sclerosing adenosis presenting with classic features of malignancy, ultimately diagnosed as benign scleros- ing adenosis. 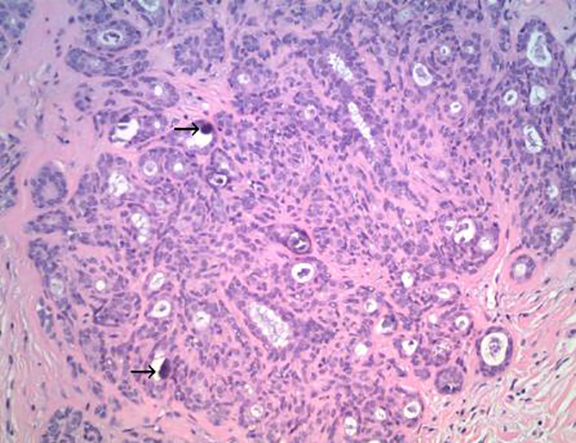 A 45-year-old Caucasian female presented with a history of right breast biopsy in 2011 that proved to be benign. Her annual screening mam- mogram continued to demonstrate a focal asymmetry within the central medial right breast as well as a group of coarse calcifications in the retroareolar region surrounding the biopsy clip. In 2013, her annual screening mammogram revealed that the focal asymmetry in the right breast was unchanged in size but had increased in density, and the associated calcifications had increased in number (Figure 1). Therefore, a contrast- enhanced MRI breast was recommended. The MRI revealed a large area of abnormal enhancement within an area of asymmetric glandular tissue (Figure 2), which corresponded with the focal asymmetry seen on the mammogram. The enhancement pattern of this area included a mixture of Type 1, Type 2, and Type 3 washout curves. The areas of abnormal enhancement had been sampled in 2011, and at that time, pathology results had revealed sclerosing adenosis. 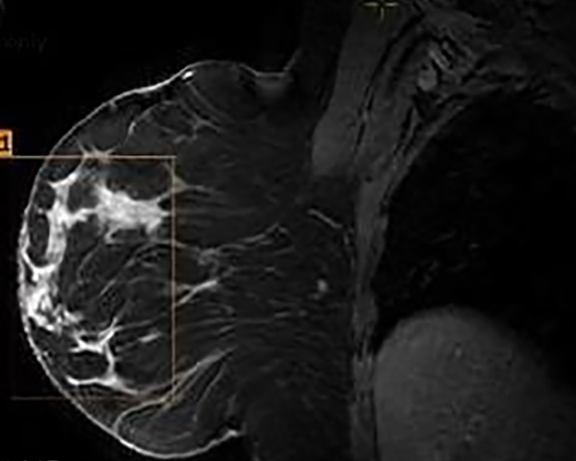 Although there had been no significant change in the overall size or the enhancement of this area since the prior mammogram and MRI in 2011, the asymmetric abnormality seen on mammogram and MRI was atypical for sclerosing adenosis. It was classified as BI-RADS 4 (suspicious finding), and repeat MRI-guided biopsy of the abnormal enhancing area was performed. Histopathology again revealed benign breast tissue, including sclerosing adenosis (Figures 3 and 4), ductal hyperplasia of the usual type, duct ectasia, small benign papilloma, and fibrocystic changes. Microcalcifications associated with benign ducts were also present in the specimen. The suspicious enhancing lesion in our patient had both Type 2 and Type 3 enhancing curves; therefore, it was biopsied. 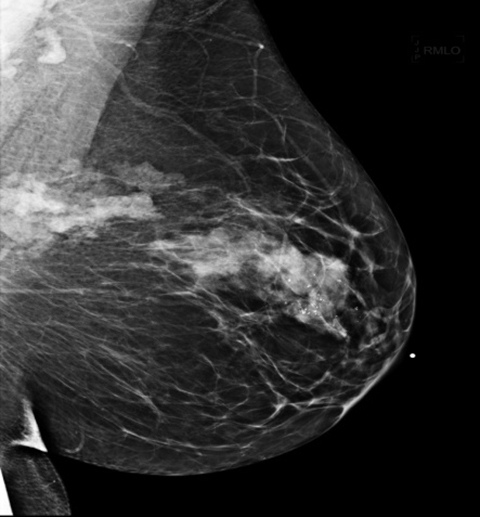 Although this patient’s breast lesion had been biopsied in the past and previously had revealed benign sclerosing adenosis, since it continued to show suspicious features on mammogram, ultrasound, and MRI enhancement kinetic analysis, a repeat biopsy was performed to confirm its benign nature. Sclerosing adenosis is a known mimic of malignancy when it presents either as suspicious calcifications or as a mass. It is strongly associated with various proliferative lesions, including epithelial hyperplasia, intraductal or sclerosing papilloma, complex sclerosing lesion, calcification, and apocrine changes. To a lesser extent, if may be associated with invasive and in situ cancers. The hypervascularity and washout kinetics of sclerosing adenosis make it extremely difficult to distinguish radiologically from carcinoma, and biopsy may be necessary for final diagnosis. Furthermore, sclerosing adenosis may continue to show suspicious features at imaging after biopsy, raising the consideration of disconcordant results. Sclerosing adenosis has been shown to be present in 12% of benign and 5% to 7%of malignant specimens on histopathological examination.2,4,8,14 Despite its benign nature, since some studies have reported a rare association with malignant lesions, clinicians could consider resecting it at initial presentation so that it does not continue to be a dilemma for the clinician, the radiologist, and the patient. Guray M, Sahin Benign breast diseases: Classification, diagnosis, and management. The Oncologist. 2006;11(5):435-449. Taskin F, Koseoglu K, et Sclerosing adenosis of the breast: Radiologic appearance and efficiency of core needle biopsy. Diagn Interv Radiol. 2011;17:131-316. MacErlean D, Nathan Calcifications in sclerosing adenosis simulating malignant breast calcification. Br J Radiol. 1972;45:944–945. Tavassoli Pathology of the breast. Norwalk: Appleton and Lange. 1992;93-97. DiPiro P, Gulizia J, Lester S, Meyer Mammographic and sonographic appearances of nodular adenosis. Am J Roentgenol. 2000;175:31-34. Gunhan-Bilgen I, Memis A, et Sclerosing adenosis: Mammographic and ultrasonographic findings with clinical and histopathological correlation. Euro J Radiol. 2002;44:232- 238. Elizabeth M, Liberman Breast MRI: Diagnosis and intervention. New York, NY: Springer, 2005. 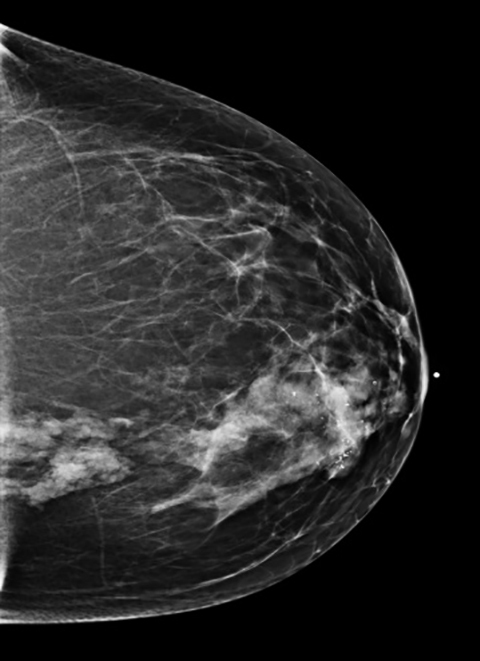 Visscher D, Nassar A, Degnim A, Frost M, et Sclerosing adenosis and risk of breast cancer. Breast Cancer Res Treat. 2014;144:205-212. Molleran VM, Mahoney Breast MRI. Philadelphia: Elsevier-Saunders; 2014. Nielsen NS, Nielsen Mammographic features of sclerosing adenosis presenting as a tumor. Clin Radiol. 1986;37:371–373. Preece Sclerosing adenosis. World J. Surg. 1989;13:721–725. Gill H, Bluffe O, Berg When is a diagnosis of sclerosing adenosis acceptable at core biopsy? Radiology. 2003(228);50-57. Macura K, Ouwerkerk R, Jacobs M, Bluemke Patterns of enhancement of breast MRI images: Interpretation and imaging pitfalls. Radiographics. 2006;26(6):1719-1735. 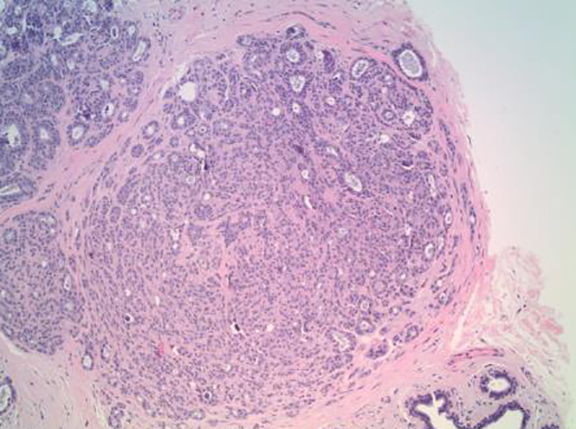 Jensen R, Page D, Dupont W, Rogers L. Invasive breast cancer risk in women with sclerosing adenosis. Cancer. 1989;64(10):1977-83. Payne E, Coker M, Bombard T, Kamaluddin Z, Cantley R, and Elsamaloty H. Sclerosing adenosis mimicking malignant lesion on breast MRI. Appl Radiol. 2016;45(4):28-31. Prepared by Dr. Payne while a Radiology Resident, Dr. Coker while a Radiology Resident, Dr. Bombard while a Radiology Resident, Dr. Kamaluddin while a Pathology Resident, and Dr. Cantley while a Pathology Resident at the University of Toledo Medical Center, Toledo, OH.